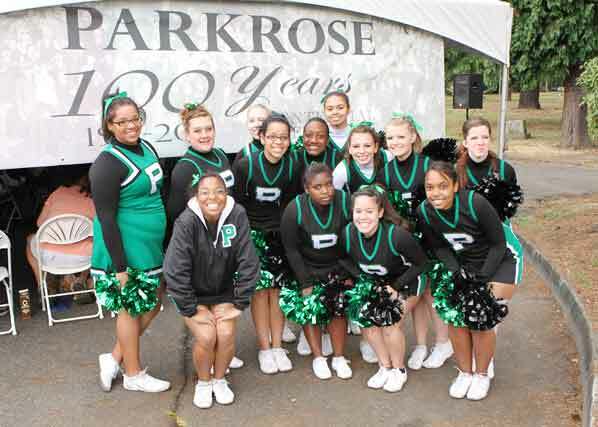 Parkrose High Broncos Cheerleaders are colorful part of the Parkrose Centennial Celebration. Although the Parkrose area was originally settled by three families in the 1840s, it wasn’t until 1911 that developers announced they planned to turn part of this rich farming area into a community. 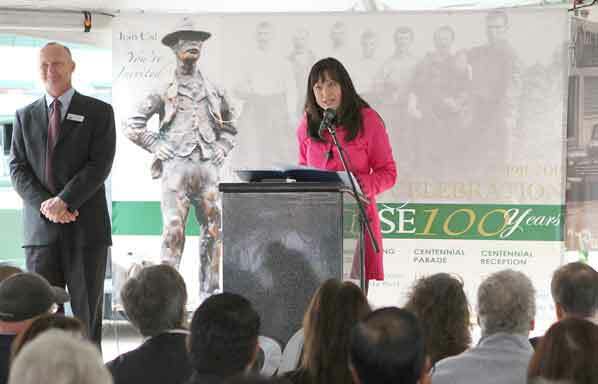 The Parkrose Centennial Celebration culminated with a dedication service, at which speakers honored immigrants – past and present. 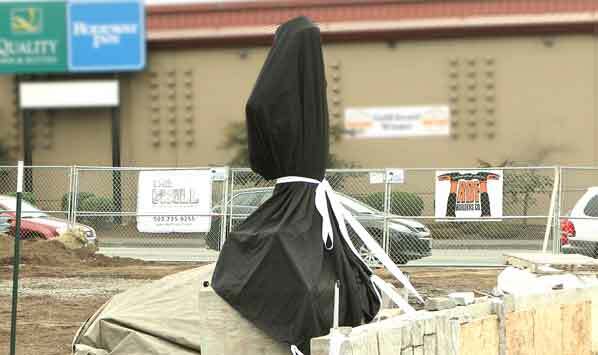 See our “Making of the Portland Immigrant Statue” story: CLICK HERE. 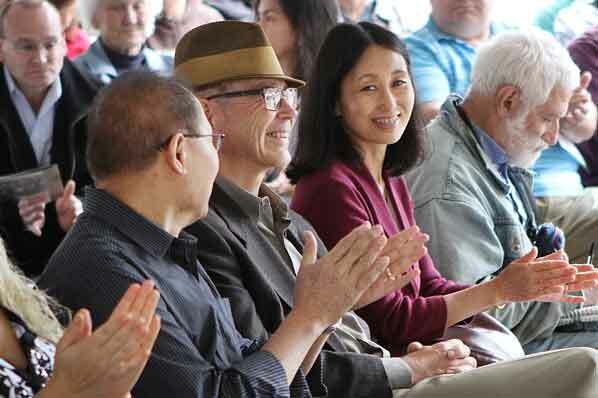 See our Parkrose Centennial Barn Bash story: CLICK HERE. 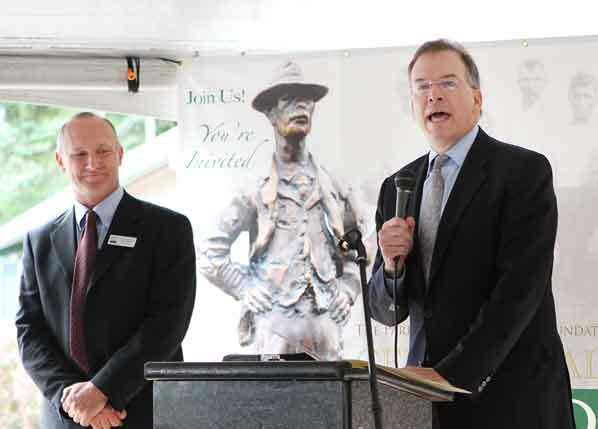 See our Parkrose Centennial Family “Wild West Show & Movie” story: CLICK HERE. Although the weather was grey and overcast and the crowds were threatened with rain, not a drop fell as more than 100 folks gathered under a large tent pitched in the circle where NE 99th Avenue dead-ends near NE Sandy Boulevard, just east of the Columbia Masonic Cemetery. 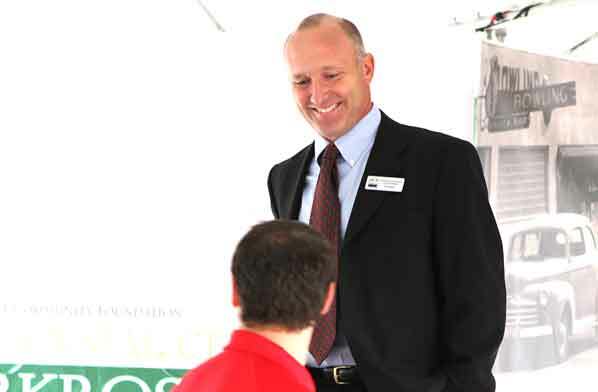 Just before the morning’s program begins, Joe Rossi, President of the Parkrose Community Foundation, shares a light moment with a member of the organization, Jason Zwick. After warming up with coffee and baked treats, dignitaries, neighbors, and friends of the Portland Immigrant Statue project settled down, as Joe Rossi set the tone for the day’s activities. 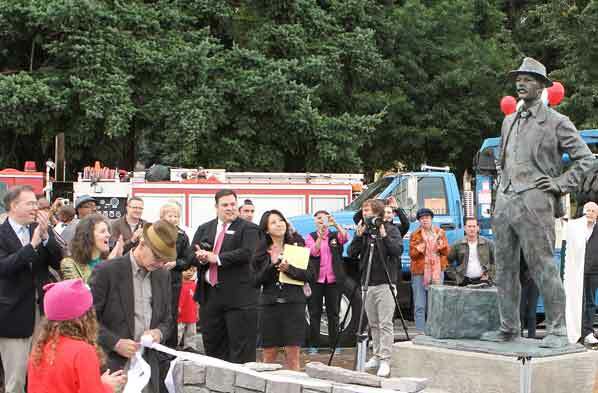 Sculptor James Gion [wearing a brown hat] smiles, as he accepts recognition for the work he’s done on the Portland Immigrant Statue project over the past three years. 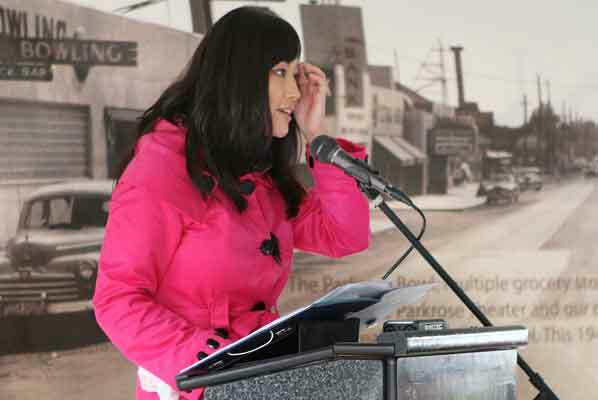 One of Parkrose’s most recognizable personalities, KATU’s Anna Canzano, tells how her family settled in Parkrose after immigrating from Taiwan. Introducing the first speaker, Rossi observed that KATU-2 television news reporter Anna Canzano immigrated to Parkrose from Taiwan with her family when she was two years old. Next to speak, Anna Canzano told of her “interesting life” growing up in Parkrose, helping her now-69-year-old mother clean rooms and manage a 28-unit motel on NE Sandy Boulevard. It was quite a change for her mother who was 37 years old when she came here to Parkrose. 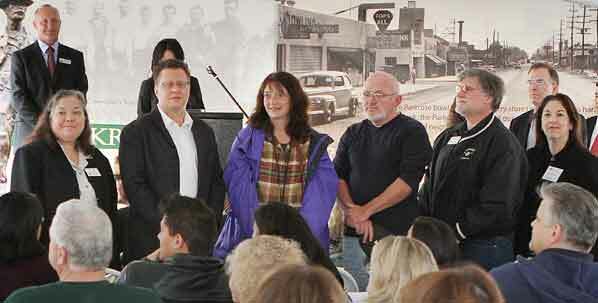 The TV newsperson regaled the audience with tales of the “colorful characters” who were in the area in those days, and what it was like for her to split her duty to the family business with going to school – eventually graduating from Parkrose High School. Anna Canzano tells how her mother supported her desire to improve herself while living, working, and going to school in Parkrose. Parkrose School District board members Alesia Reese, James Woods Ph.D., Adair Fernee, VP Guy Crawford, Chair Ed Grassel, and Superintendant Dr. Karen Fischer Gray are recognized for continuing their efforts to provide quality education. 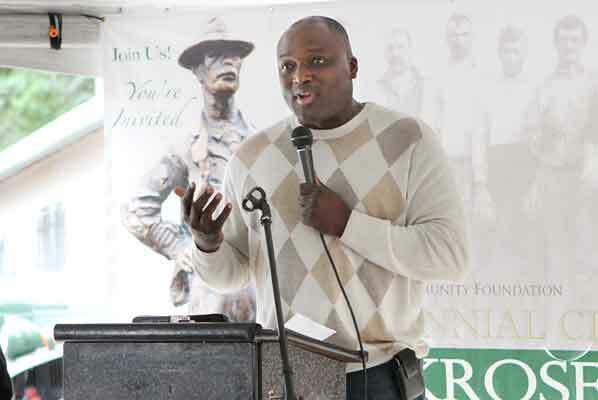 Ken Bello, project manager with Walsh Construction, who oversaw the construction of the “Parkrose Triangle” traffic island on which the Portland Immigrant Statue now stands, tells of his special connection to the project. Amelia Salvador says she feels privileged to have been able to work with Parkrose Centennial projects. 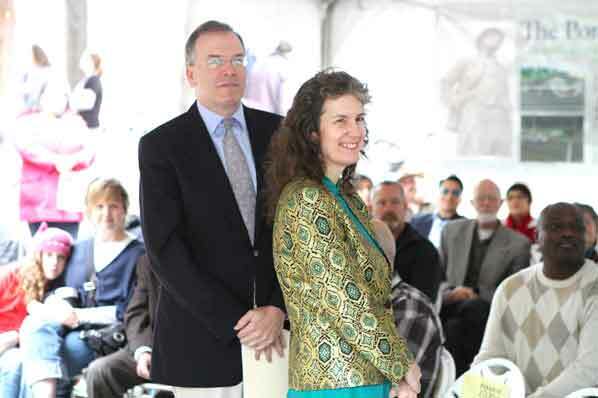 Portland City Commissioners Nick Fish and Amanda Fritz are introduced. The theme of Portland City Commissioners Nick Fish’s talk revolves around two immigrant women who have been prominent in his life. Minutes before the Portland Immigrant Statue is unveiled, Commissioner Fish tells how the project was accomplished without any public funding. For his own efforts to bring Parkrose the Portland Immigrant Statue project, Joe Rossi receives a standing ovation. 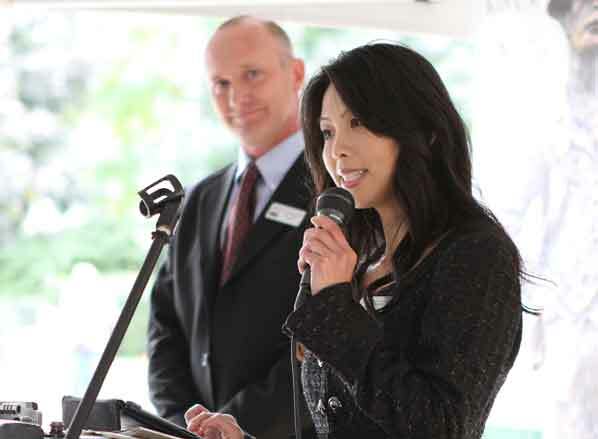 Joe Rossi asks Jamie Lim, of First United Engineering, to come forward to accept the 2011 Portland Immigrant Award. 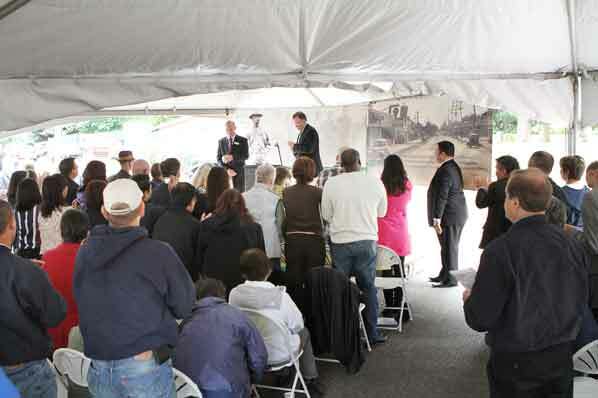 To conclude the morning ceremony, Rossi asked Jamie Lim, PE, PLS, of First United Engineering – he was the project’s architect – to come forward. 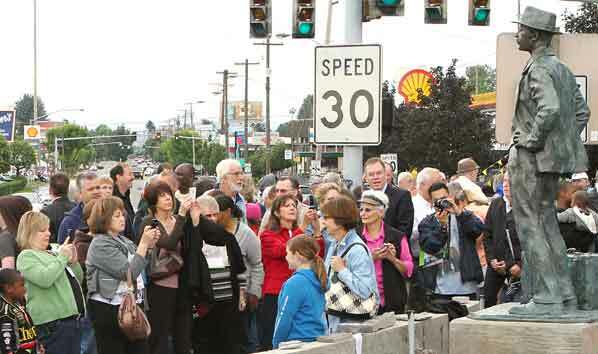 In the moment after its cover was whisked away, the group applauds as the Portland Immigrant Statue is revealed. Hundreds gather around the Portland Immigrant Statue to take photos. In the parade, 2011 Parkrose Rose Festival’s Parkrose Princess, Taylor Ballard, smiles at the crowd. Here comes the parade, east along NE Shaver Street. 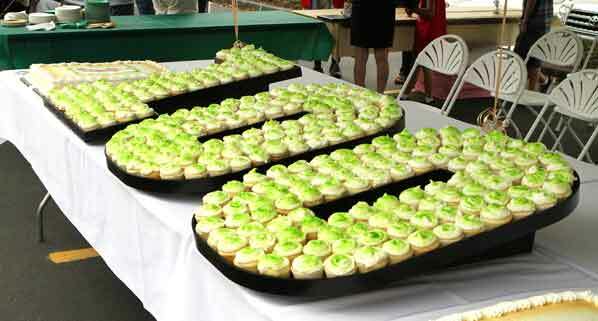 The arrangement of these cupcakes suggests the reason for the celebration. 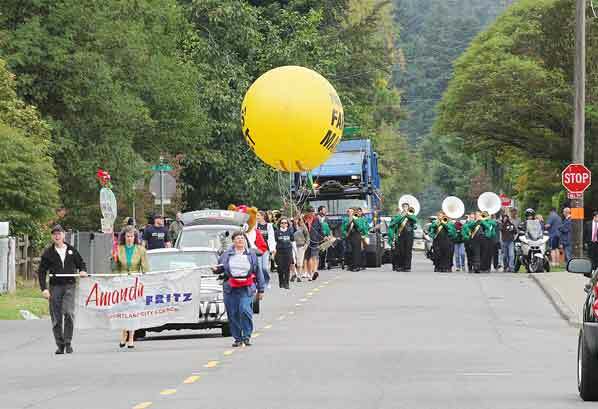 After the ceremony and the unveiling of the statue, the Parkrose Centennial Parade traveled from the Parkrose Triangle east to Parkrose High School, where a reception awaited revelers. Behind the Parkrose Farmers Market, celebrants gathered near tents set up for the Parkrose Centennial reception. 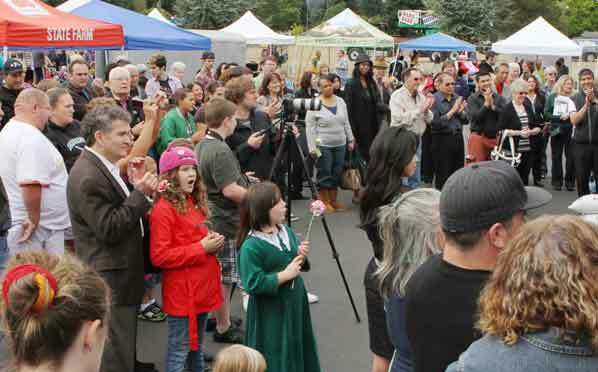 Friends and neighbors gather to celebrate Parkrose’s 100th “birthday”. 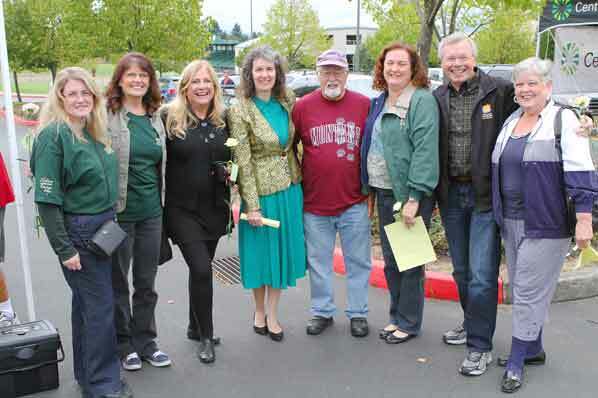 Representing the Parkrose Business Association at the celebration are Debby Codino, Marsha Lee, Kyle Zeigler, Portland City Commissioner Amanda Fritz, Bob Roberts, Alison and Wayne Stoll, and Sharon Roberts. 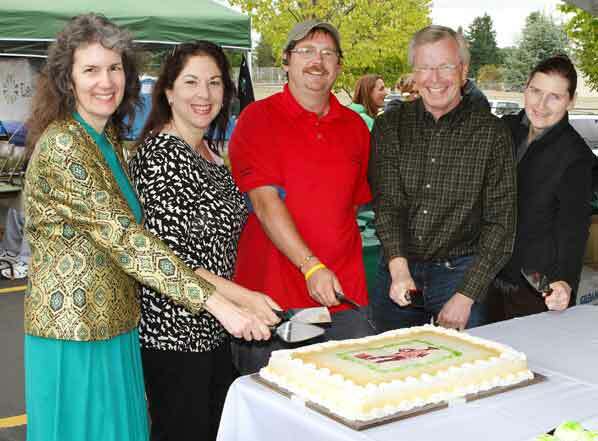 Ready to cut one of the ceremonial cakes are Portland City Commissioner Amanda Fritz, Parkrose School District Superintendent Dr. Karen Fischer Gray, Parkrose Farmers Market Master Steve Voorhees, Parkrose Business Association President Wayne Stoll, and Parkrose Neighborhood Association Chair Mary Walker. As the cupcakes were snatched off the display, and the delightfully decorated and delicious cakes were cut and distributed, Joe Rossi watched the throng of celebrants. Asked what his dad, Aldo Rossi, might have thought of the day’s events, Rossi responded, “Dad would have been so happy. He loves a party, he loves community, and he loves the school. He would have been the happiest person they are today, had he been here. 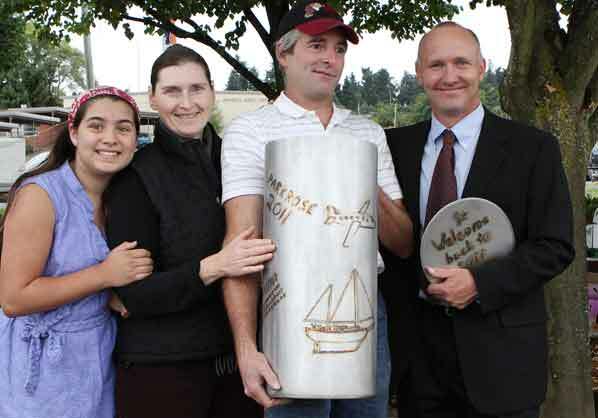 The Walker family – Elizabeth and Mary stand with Brian Walker – he created the steel “Parkrose Time Capsule” – as they present it to Joe Rossi. It will be buried near the Portland Immigrant Statue after being filled with mementos.